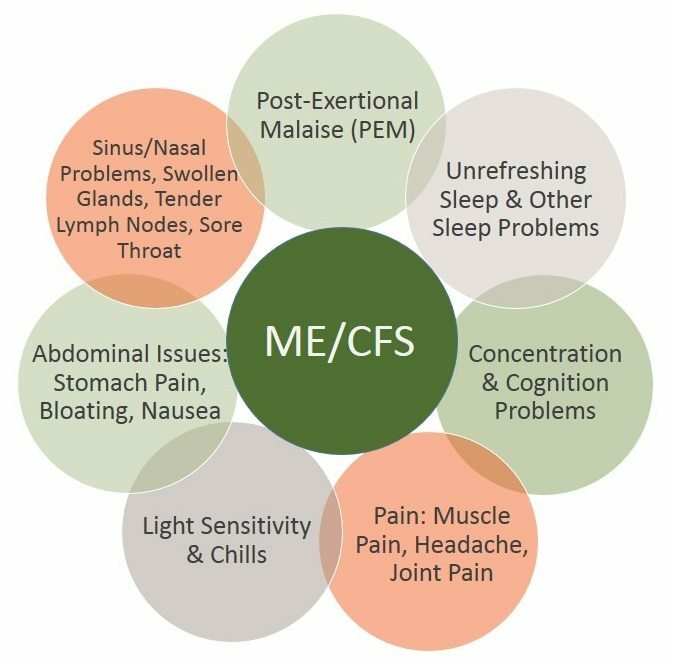 Myalgic encephalomyelitis (ME), commonly referred to as chronic fatigue syndrome (CFS), is a complex and debilitating chronic disease with a serious impact on one’s quality of life. Approximately 1 – 2.4 million people in the United States have ME/CFS, and the condition affects millions more worldwide. Although research has shown that ME/CFS is about two to four times more likely to occur in women than men, ME/CFS strikes people from every age, racial, ethnic, and socioeconomic group. If you think you may have ME/CFS, take our quick online quiz. Studies show that fewer than 20 percent of ME/CFS patients in the United States have been properly diagnosed. Diagnosing ME/CFS is a challenging process because there is still not one diagnostic test or biomarker that’s conclusive. The process requires tests to rule out other conditions that may present similar symptoms before a diagnosis of ME/CFS can be established. It can take months. Diagnosis can also be complicated by the fact that symptoms and severity of ME/CFS vary considerably from person to person. Seek care first from the healthcare provider who knows you best and will work with you to rule out other possible causes of symptoms and identify other conditions. Since no cause or cure for ME/CFS has been identified, treatment is directed at relieving symptoms. Although there’s no single treatment that fixes the illness at its core, there are treatments that can improve symptoms, increase function, and allow people with ME/CFS to engage in activities of daily living. Sleep problems, pain, heart rate irregularities, gastrointestinal difficulties, allergies, and depression are some of the symptoms that can potentially be relieved by treatment. Alternative therapies are also often explored in an attempt to relieve symptoms. Acupuncture, hydrotherapy, yoga, tai chi, and massage therapy have been found to help and are often prescribed for symptom management. What Is It Like Living with ME/CFS? The severity of ME/CFS varies greatly from patient to patient, with some people able to maintain fairly active lives. For others, ME/CFS has a profound impact. About 25 percent of people with ME/CFS are disabled by the illness and there’s often a pattern of relapse and remission. Most symptoms are invisible to others, which makes it difficult for family members, friends and the public to understand the challenges of the condition. More severe ME/CFS patients have been found to be more functionally impaired than those with other disabling illnesses such as type 2 diabetes, congestive heart failure, hypertension, depression, multiple sclerosis, and end-stage renal disease. These same patients have the lowest median quality of life scores of any disease tested, including lung cancer, rheumatoid arthritis, and brain stroke. Why Has ME/CFS Progress Been So Slow? The National Institutes of Health (NIH) publishes a list annually showing its spending on various diseases. In 2015, the ME/CFS research budget, ranked in order by research dollars, was 249 out of 265 diseases funded—almost at the very bottom. In actual dollars, government spending on ME/CFS is less than is spent on hay fever. To really make headway in a timely manner toward making ME/CFS understood, diagnosable, and treatable, we need more government funding. A couple of days ago there was a paper published online in PLOS Biology that outlined how the Sugar Research Foundation (SRF) doubled down on misleading consumers by stopping a 1970 study that withheld information the microbiome may be an important factor in sugar-caused high triglyceride levels and that sucrose (sugar) consumption, compared to starch (like potatoes, bread, etc. ), might be associated with bladder cancer! It seems Big Sugar underwrote research at the University of Birmingham (England) to study rat diets, gut microbiota, and blood lipids (triglycerides) in the late 60s. Called Project 259, the rat research inconveniently found that sugar raised triglyceride levels and that it could be a human carcinogen. This was at the same time that another suspected carcinogen, cyclamate, was being taken out of diet drinks and foods. Sugar didn’t want to be branded as a cancer-causer–even though 2014 research found it feeds cancer cells preferentially–so the sugar industry stopped Project 259 before it was completed. More recent research shows that high insulin levels and growth factors caused by sugar ingestion influence cancer cell growth the most, as well as increasing the risk of other chronic diseases. Earlier, some of the same researchers published a paper in the Journal of the American Medical Association describing how the sugar industry secretly funded a 1967 review in the New England Journal of Medicine that failed to mention how a rat study involving sugar showed increased cardiovascular disease and lipid (fat) levels in the blood and instead put the blame on dietary fats and cholesterol, leading to the whole fat scare and atrocities like SnackWells(R) that were low-fat, but full of sugar. The article was very interesting to me, possibly because before I went back to school to be a nurse and then nurse practitioner, I worked in public relations for almost 20 years and was a member of the Counselors Academy of the Public Relations Society of America. I think it would be interesting to anyone who likes to read history, though. It certainly does not read like a typical medical research study. Obviously, fake news wasn’t invented in the last presidential campaign. The sugar industry was in it up to their eyeballs way back when the Green Bay Packers were playing in the first SuperBowl and the Israelis and Palestinians fought the six-day long Yom Kippur War. But they weren’t the only ones. Industries wanting influence over state and federal regulations have a history of funding research resulting in industry-favorable interpretations of controversial evidence related to health effects of smoking, therapeutic effects of pharmaceutical drugs, the relationship between sugar-sweetened beverage consumption and weight gain or obesity, and the causes of climate change (Oreskes N, Conway EM. Merchants of doubt. New York: Bloomsbury Press; 2010), among other issues. And let’s not forget about one of the largest influencers of the USDA, FDA and Congress: Monsanto and its hit herbicide, RoundUp(R), also called glyphosate. I’ll get back to this in a later blog. There’s just too much of a horror story with them to mix this up with sugar’s withholding and also manipulating unfavorable data. The deliberate, profit-lead poisoning of America’s food supply by both the raw material manufacturers (agri-business) and consumer product manufacturers (General Foods, Kraft) really frosts me. Unfortunately, duplicity and data destruction goes on in the medical industry, too. And much of all this fakery and selective data selection is the brainchildren of public relations execs like I used to be. I’ll get into all that later. Although ME/CFS was not listed as one of the chronic conditions* reported in a recent study of the differences in how older and younger people live with multiple chronic conditions (MCC, >2 co-occurring chronic conditions), there still were interesting findings. The study was performed by Mary L. Adams, MS, MPH and published in Preventing Chronic Disease, a CDC publication, and republished on Medscape.com, a site for health care professonals. The study was robust, with over 200,000 records examined. Naturally, there were differences arising from life lessons learned and also from lifestyle choices, like smoking tobacco and obesity. Typically, MCCs increase with age, resulting in increasing Medicare costs. The study measured disability status, quality of life measures, chronic conditions, risk factors, and access to health care. Surprisingly, people younger than 65 represented the majority (>60%) with MCCs. Among adults with two MCCs there were significant differences by age group in 18 measures, indicating that adults younger than 65 were worse off than adults aged 65 or older. Results were similar whether diabetes, depression, hypertension, high cholesterol (which could also be risk factors) were included. Most uninsured adults are younger than 65 years, and younger adults with MCCs were more likely than older ones to report a cost barrier to their health care in the past year. Younger adults with MCCs were also less likely to report a recent routine check-up than adults aged 65 or older with MCCs. Taking preventive health measures, like seeing a healthcare practitioner or eating real food, is a learned skill and one I hope to teach through this blog. Annual medical care expenditures for chronic conditions in adults aged 18 to 44, 45 to 64, and 65 or older with MCCs were similar at approximately $9,000 for those with 4 or more chronic conditions and approximately $4,000 for those with 2 or 3. Frankly, this surprised me. I probably spend $9,000 in out of pocket costs when I add up just my supplements and the costs associated with my service dog, The Divine Miss Em, like food, toys, and gear (just kidding). Consistent with common sense, people with 3 or more chronic conditions and those with CVD (cardiovascular disease) or diabetes [OR ME/CFS] were more likely to report poorer quality of life than those with fewer or different chronic conditions. This analysis did not compare age groups and could have been influenced by higher rates of depression in younger people. Differences in reported quality of life could also result from different contexts, because younger adults are more likely to be employed than older adults. For example, interpretation of activity limitations may depend on age, employment status, or both. However, even when controlling for measures including employment status and depression, these age differences remained for 14 measures representing a range of outcomes. The results may also reflect the direct or indirect impact of other factors such as smoking or obesity that are also higher among younger adults and may affect health and disability status. An unexpected finding was the high rate of cognitive impairment among younger adults with MCCs. This could result from lower rates of other chronic conditions or factors such as lack of sleep, side effects of medication, or use of illicit drugs and may not be associated with future risk of dementia. Whatever the cause, being cognitively impaired may affect someone’s ability to self-manage other chronic conditions. Younger adults were also more likely than older ones to report risk factors that can increase the chance of developing additional chronic conditions in the future. Age-related differences in MCCs using hospital discharge data indicated, for example, that among adults 18 to 44 years, depression and substance abuse were most common. This old-young comparison study’s results, which did not collect information on substance abuse, are consistent with the earlier finding by showing that depression was more common among working age adults with or without MCCs. Along with depression, risk factors of obesity and smoking were also higher among younger adults with and without MCCs. Whatever the cause of the differences, results highlight the current impact of MCCs on younger adults as opposed to Boomers. This study also supports the finding that teenagers now are the first generation to be less healthy than their parents. How do you feel about this? Do you think a younger person with ME/CFS has a harder time than someone over 65? *MCCs were based on up to 12 chronic conditions (heart disease, stroke, asthma, arthritis, chronic obstructive pulmonary disease, high cholesterol, cognitive impairment, diabetes, depression, chronic kidney disease, cancer other than skin, and hypertension). Don’t know about you, but I really dislike most salads and cooked greens. I ate vegetarian for a couple of years when I was living in a Buddhist household in Milwaukee. I don’t recall problems cooking or eating, but I do remember we ate a whole lot of salads. Nutrition wasn’t something I thought about a whole lot. At that time, I was going to the Milwaukee School of Engineering to get my bachelor’s in nursing and Eric (Ric) and I were separated. Corey (Corinna, our daughter) was away in her first year at The Citadel. I was attending class, full-time, all day and then I worked the overnight shift (7 pm to 7 am) at a local hospital on Friday, Saturday, and Sunday nights. But enough background for right now. I figured out that the only way I was going to eat enough greens to satisfy my recovering body’s need for good nutrition was to do smoothies in my old Vitamix blender. I bought it in 1995 when I had severe TMJ and whiplash and could open my mouth only far enough to slip through a straw. Everything I ate for several weeks was thrown into the V-M and whirled to become liquid. Another important aside: Were you aware there are proven diets to reverse heart disease, Type 2 diabetes, and hypertension (high blood pressure)? Unfortunately, doctors get only a tiny bit of nutrition education in medical school and often do not know about the importance of diet/nutrition in keeping us healthy. So instead of encouraging us to eat a sensible, whole food diet, we are given pills that suppress the symptoms but never touch the cause. Nurse Practitioner education is not much better. I’ve never looked at a syllabus for Physician Assistant education, but I bet it has very little on nutrition, too. A huge part of our nation’s growing problem with obesity and diabetes is that people who begin to investigate about nutrition and diet run into a deluge of conflicting and confusing advice. What to do? When I want evidence-based information about nutrition I go to two sources. The first is Nutrition Facts. This site is a non-commercial, science-based public service provided by Dr. Michael Greger that relies on individual donors to keep the site alive. There are more than a thousand videos on nearly every aspect of healthy eating, with new videos and articles uploaded every day. Best of all everything is free of charge and evidence-based. The second site I use is called GreenMedInfo. Sayer Ji, the site’s founder, has a robust natural medicine database with over 10,000 health topics. Searching for ME/CFS brings up 30 entries with the first one being the book Plague, about the retrovirus controversy from five years ago. Querying with Chronic Fatigue Syndrome brings up 45 abstracts of published papers, 19 substances (adaptogens, curcumin) that are used for treatment, six “problem” substances (breast implants, aluminum hydroxide), six therapeutic modalities (yoga, acupuncture) and two problematic actions–vaccinations in general and Hepatitis B vaccine in particular. There is a monthly/annual fee for accessing the database, but there is an informative, free newsletter. Back to maximizing nutrition. Phytonutrients, like beta-carotene and lycopene, can exist as microscopic crystals trapped inside the cell walls of fruits and vegetables. They’re only released when the cells are disrupted, which is why my mother was right–we have to chew our food really well. Food particle size ideally would be reduced to smaller than the width of individual plant cells. Most vegetable particles end up greater than two millimeters when you chew them, but when we break open all the cells in a blender (especially Vitamix and Blendtec), we release much more nutrition. Green vegetables, like kale, are very healthy and good nutrition. enough kefir, kombucha, coconut water, or filtered water to come up to the top of the ingredients in the container, usually 8-10 oz. You’ll want to mix this very well so there are no remaining lumps from frozen berries. With my old VM, I have to stop every now and then to pound the container on the counter to let the thick mixture settle into the air pockets introduced by blending. You can add more liquid if this occurs, but I prefer my smoothie to be almost the consistency of soft serve ice cream. Absorption of nutrients is the next step in maximizing our nutritional intake from real foods. Real food is anything that does not come in a box, is a single entity (a potato), contains no refined grains, such as enriched white flour or any type of white rice, and no added sugar–real or sugar substitutes, like high fructose corn syrup or Splenda(R). More about nutrition and cooking later. Besides eating real food, not processed, getting a regular full body massage and consuming probiotic beverages like dairy kefir and kombucha the single thing that made the most difference in my recovery from ME/CFS was a video program. No, nothing on TV; we haven’t had a TV set in the house since 2010. Instead, the program I’m talking about was devised and developed by an amazing Australian engineer who had this damn disease and suffered through all the ups and downs in health and emotional status. Like all of us, he went from doctor to doctor, and from one alternative health practitioner to another and spent lots of money on visits, medications, and supplements. Since the dawn of antibiotics, we have developed the belief that a doctor can cure us. Yet, people with ME/CFS know that we cannot be cured (although many of us still cling to hope). Dan Neuffer put his logical engineer’s mind to learning all he could about the disease. After much study, he decided himself (because no one was talking about it publically at that time) that a breakdown of the autonomic nervous system (ANS) was the root of all the problems we have. In addition to ME/CFS, he includes fibromyalgia, electromagnetic and multiple chemical sensitivities as caused by a broken ANS. Dan learned that healing from illness or injury takes time, but can be accelerated through good nutrition and adequate rest and relaxation.He found that although there is no magic bullet, there is a clear path to recovery. In his book, CFS Unraveled, Dan laid out his hypothesis that the countless (seemingly) symptoms we experience all stem from a faulty ANS. He also found that treating problems in isolation doesn’t work. Neither does treating secondary problems alone. He realized people with these conditions must treat the root cause, treat in the correct order and find their own personal triggers. Realizing most people will need more coaching than the book provides, Dan developed a robust, comprehensive program that can take a person with the ME/CFS, fibro, EMS and MCS constellation of symptoms all the way through to recovery. He calls it ANS Rewire since that, literally, is what is done during the course of the program. The program’s core training is rolled out in daily videos for 6 weeks with more focused lessons during the following months. I found the structure of the lessons and the way the program is delivered to be easy to accomplish and, at the same time, beneficial and appealing to my medical background. You can tell immediately just by looking at the site that Dan goes above and beyond when it comes to helping folks with our disease(s) recover. After laying out the science behind ANS-related symptoms, Dan delves into brain training, physical strategies, supporting strategies and tools we can use to help accomplish our goals. Although I heartily endorse Dan’s work, I am not related by birth or marriage and do not receive payment for referrals to his ANS Rewire recovery program.